I love this watch and I would recommend to a fiend. 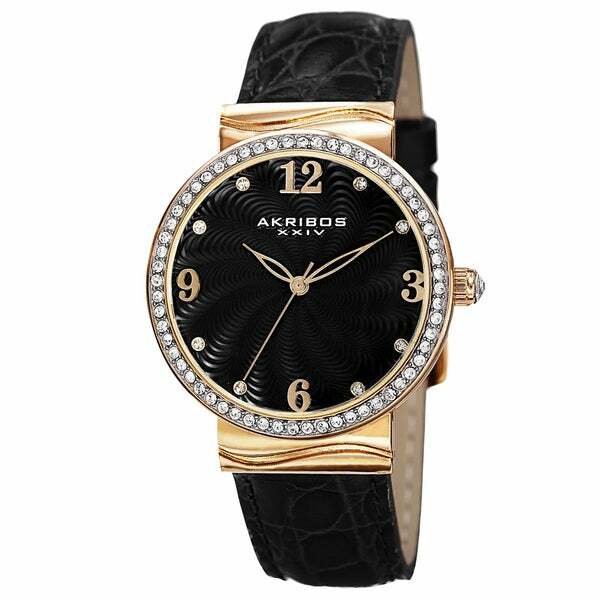 This women's timepiece presented by Akribos XXIV features sparkling Swarovski crystals. The crocodile strap is made of genuine leather and the sleek hands give this watch a chic and classy look. This timepiece will definitely add elegance to your wrist. This watch is attractive and I would recommend it for those who are looking for a black strap watch with a crystal bezel. The numbers are easy to read and the watch keeps accurate time. I purchased this for my wife and she absolutely loves it. It's a beautiful little watch that she calls her "Sunday Watch" because at first she just wore it to church on Sundays, but that has since become a daily wear item as she is so pleased with it. I would definitely buy it again and would recommend it to anyone considering it's purchase. Love this watch. Only issue is leather band is not very flexible so watch does not lay nicely on your wrist. I bought this watch for my daughter for Christmas. The black is so classy looking and the crystals surrounding the watch are a great added touch! Sent to my mom for Christmas. She lives the look of the watch. She told me she hopes the band softens up being its pretty stiff on the wrist. If the manufacturer is paying attention as it should it would be nice to consider fixing that issue. Otherwise so far nice. This item is on its way, but I know that I will be more than happy with the quality of this watch because I own this brand of watch already. Picture nicer than reality. Band is stiff. Not comfortable. Otherwise, ok for the price. Would not purchase again.